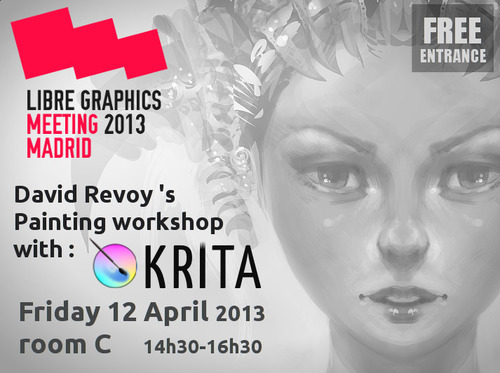 The workshop will be about digital painting with Krita. I'll adapt my workshop to my audience, but my main guideline will be "speedpainting with Krita : tips and tricks to refine your process." And the idea I have in head is to build a symmetry portrait as the one I painted on my previous post here , step by step. I think its a good exercice for beginner or experienced artists, accessible and also very fast rewarding : Krita paint literally half of the artwork for you. Friday 12 april 2013 at the Libre Graphic Meeting in Medialab Prado‘s brand new building in Madrid city center. More infos on LGM official website . LGM is free and open to all! Registration is not required. But feel free to leave a comment if you can be around. I'll keep the demo active and interactive, participant can bring laptop and tablet with Krita ( <= 2.6 ) to paint during the presentation. Note: It's also OK to come with Mypaint or any other software. Curious and spectator without tablet hardware or laptop are also warmly welcome. License: CC-BY David Revoy, www.davidrevoy.com, 31 march 2013 . "LGM is free and open to all!" OMG!!! I envy those who can visit this event. Sooooo many interesting! Krita is definitely worth propagate. Is the video recording will be available from this meeting??? Will the video be available later online ? Yes, Deburger we only dreamed of such seminars.